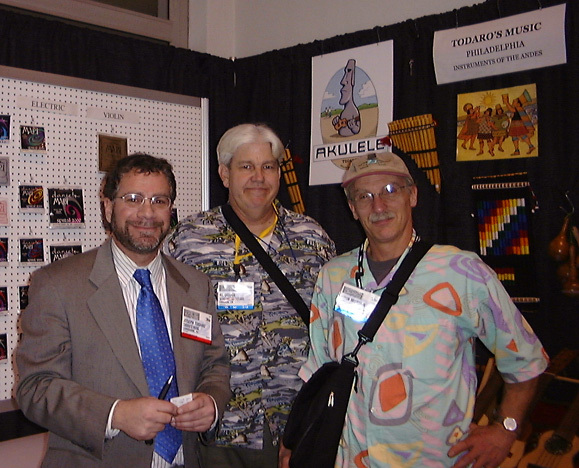 January 2001 - I had returned home from the NAMM trade show having debuted my new ukuleles. Many people admired this new idea and one of them was Al Dodge. 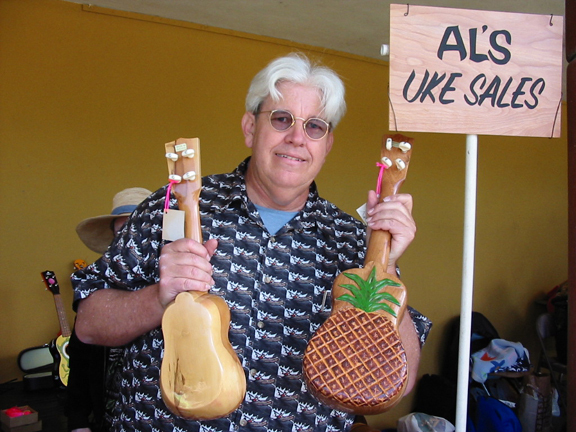 Al is a player with The Cheap Suit Serenaders and also makes fine ukuleles that he also designs. I had met Al several years earlier when we discussed string instruments and found that we shared a common interest. When Al learned that I played with the Munier Mandolin Orchestra in Philadelphia we began to discuss the history of the orchestra and the long list of great instruments that the players own. Al was kind enough to send me some of his rare Pettini picks that dated back several decades. We were both string instrument lovers and soon began to discuss charangos, ronrocos walaychos and of course ukuleles. I had called Al before the show to tell him about my new ukes and he was looking forward to seeing them. When we met at the show we spent some good hours talking about the design and its attributes and how it could be improved. 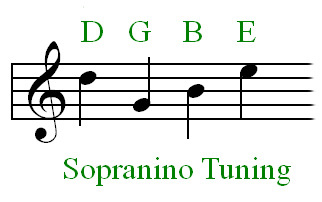 With Al's encouragement I felt confident that my new ukuleles would be met with a postive response by the players. The name I had originally chosen for the uke was Ukelinda. I had decided on this name because the first time I strung one up in Aiquile and then heard the sound I said "how beautiful" or in Spanish "Que Linda" . Later back in my shop I thought of "U Que Linda" or "Ukelinda" for "Oh How Beautiful". So it was with Ukelinda that my new ukuleles debuted. Then at the NAMM show Al Dodge also suggested that I call his friend Bob Armstrong to see if he could help me with a label. A week after our meeting Al called me to tell me that he had a revelation, "your instrument should be called Akulele", he said. Aku Aku are the gods of Easter Island he explained to me. Then he bagan to tell me that the culture of the island was said to be a mixture of the Polynesian and South American cultures. He thought my new ukulele was also a mixture of cultures, an island instrument built in the traditional style of the Andean charango. And hence he came up with a totally appropriate name, Akulele. I enjoyed his explanation and instantly was elated with the new name. I had always admired Thor Heyerdahl and had read Contiki many years earlier. These cultures had long fascinated me and that is why I had began my journies through Bolivia. I thanked Al and told him that I would also take his advice and call Bob Armstrong regarding a label. Little did I know that Bob's label would be equally as amusing. I am greatful to both Al Dodge and Bob Armstrong for their ideas. The Akulele now had a great personality with its new name and label.